In early January, the Eastern Seaboard was hit by a severe snowstorm, resulting in 1,000 flight cancellations and 140 aircraft diversions at New York’s JFK airport. The disruptions lasted for two days, leaving passengers stranded, some with lost luggage and no flight information. “What happened at JFK, as we have emphasized over the past two weeks, was unacceptable and must not be allowed to happen again,” stated the Port Authority. The chaos also caught the attention of IATA, which is coordinating efforts to ensure airlines, airport authorities, air traffic control authorities and other key aviation stakeholders communicate critical information better when there is an incident causing severe operational disruptions at a major airport. An independent investigation, led by former U.S. Transportation secretary Ray LaHood, was launched into the causes and background of JFK’s storm-related failures. This included backed-up incoming aircraft waiting for available gates, a water pipe break and flooding of Terminal 4, a shutdown of Terminal 1 as ground equipment froze, and even an aircraft clipping incident outside of Terminal 4. In a Feb. 22 speech at the Aviation Day Conference in New York, IATA director general and CEO, Alexandre de Juniac, said the association was working with stakeholders to dissect what happened and to be better prepared for future extreme weather events. He noted, that in 2017, more than 100 million travelers – en route to and from the metropolitan region – were served by some 1.2 million flights from New York’s three main airports, or roughly 3,300 flights per day. By comparison, Toronto Pearson handles about 1,200 flights a day. “I think all stakeholders would agree that our collective response did not meet the expectations of the travelling public,” de Juniac said. “I won’t pre-judge the results of these efforts, but one thing is already clear. We did not have enough processes in place to ensure that all parties had timely access to the same information on which effective and coordinated decisions could have been made. 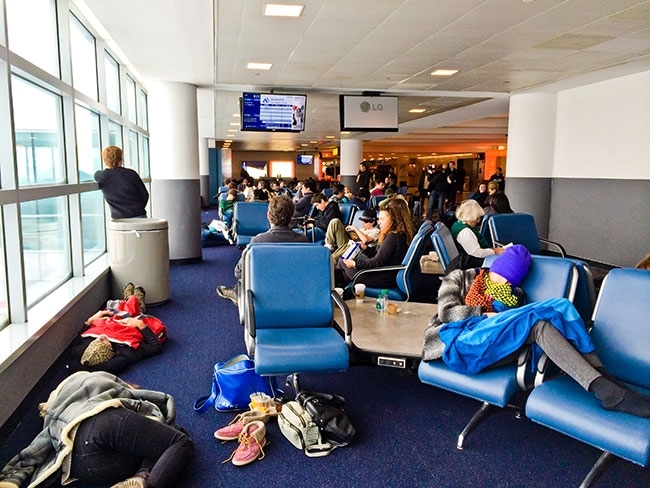 A similar disruption occurred March 7 to 8, when more than 200 flights were cancelled at New York’s three main airports, in addition to other east coast airports. Delta Air Lines moved to restore operations on the Monday after a complete power outage at its base hub at Atlanta Hartsfield forced the airline to cancel about 1,300 flights on Dec. 17 and 18. According to utility provider Georgia Power, a Dec. 17 fire in an underground facility “caused extensive damage,” including to substations serving the airport. Despite “many redundant systems” in place to preserve power to the airport, it was lost for 11 hours, cancelling more than 1,000 flights in and out of JFK. A focus area for the IATA initiative is on improving communications between the airlines, airport authorities and air traffic control (ATC) organizations. IATA regional vice president, Americas, Peter Cerda said meetings are planned with the FAA and the New York Port Authority. The goal, he said, is to align everyone better and take a proactive, systematic approach to communications when there is a major operations disruption. Cerda pointed out, that to get aircraft in the right place and to be able to get delay and cancelation-related information quickly to passengers, airlines must have usable information from the airports and ATC authorities. “Better communications is key in any disruption and it’s a weak point. The focus is on getting the right information to the right people at the right time,” said de Juniac.